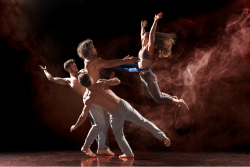 THE award-winning circus company Barely Methodical comes to Poole’s Lighthouse on Wednesday 24th and Thursday 25th October with the newest show, Shift. It follows their internationally successful shows Bromance and Kin and once again combines acrobatics with the emotional punch of theatre as four performers test their physical limits. Marooned in an unstable environment, where everything moves and nothing is certain, the performers work to understand the space in which they find themselves. Using every available resource – string games, storytelling, rubber bands – they explore all possibilities, trying to gain some control. Shift challenges perceptions, experiments with pace and plays with ordinary objects, creating an unusual dreamscape. It’s fresh, fun and scary, they say. Shift features core company members Louis Gift and international cyr wheeling star Charlie Wheeller, working with Spanish break dancer Elihu Vazquez and Swedish acrobat and flyer Esmeralda Nikolajeff. Posted in Circus, Let's Dance on 18 October, 2018 .